Photo courtesy of Peter G. Aiken of USA TODAY Sports. The best thing to come out of Southern Indiana since Bob Griese just became the 32nd Division I men's basketball player from the state of Indiana to total 2,000 points. Check out D.J. Balentine's journey to eclipsing the century mark twice. 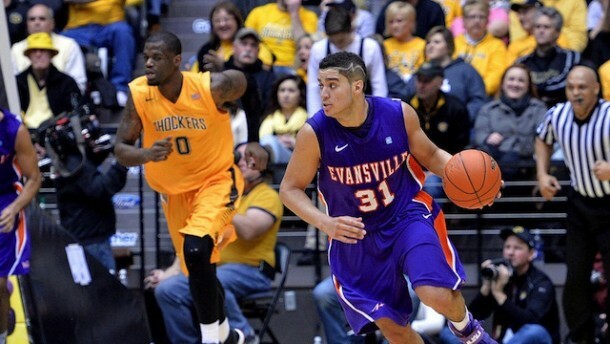 When the 2012-2013 season ended in Evansville, Indiana, the big question surrounding the Evansville Purple Aces was rather simple: Who would put upon themselves the scoring load previously carried by the university's most prolific scorer Colt Ryan. The answer was D.J. Balentine. Balentine, who was a very underrated shooting guard out of Kokomo, Indiana, burst into the national spotlight as a sophomore when he averaged a whopping 22.8 points per game. Since, he has continued to keep his average over 20 points per game while leading Evansville to its first post season championship (2015 CollegeInsider.com Tournament) since 1971 (Division II NCAA Tournament). But who really predicted the outstanding production from the now 22-year old? If one would have looked at his freshman stats, he or she would have known immediately! During his first collegiate season, Balentine added 8.1 points per game, which was the highest mark from a freshman since the aforementioned Ryan's 15.7. What do you mean 'known?' His points per game were barely over half of Ryan's! Although Colt Ryan had the much better first campaign, Balentine has been superior since, while becoming the most dominant scorer in the Missouri Valley Conference. Literally imported into Ryan's spot in the Purple Aces' offense (which includes the cutting off of screens to obtain catch and shoot opportunities), Balentine's sophomore numbers soared in all statistical categories, including points (22.8 per game). As a matter of fact, he even saw himself put on the All-Missouri Valley Conference First Team for the 2013-2014 season! After once again being named an MVC first teamer this past March, the 6'2" guard continued to add accolades to his already storied career by being named the 2015 CollegeInsider.com Tournament Most Valuable Player and surpassing 2,000 points for his collegiate career Thursday night. But would you like to hear the most interesting part? When D.J. Balentine breaks Colt Ryan's scoring record it will be his 2,280th point, exactly 1,000 more than he netted in high school, to cement him at the top of a list that includes greats like Larry Humes and Jerry Sloan.